For the adventure hungry traveler, it’s always nice to get off the beaten path and escape the hectic city life and crowded, lively streets. I found the answer to my desires: zip lining & white water rafting in Chiang Mai! Get in touch with your primate past in the jugle tree-tops! When was the last time you felt so free you could actually fly? Well, now you can as you zoom through jungle canopies and soar over mighty rivers on zip lines, cables, platforms, and sky bridges! With varying heights and distances of 20 to up to 400 meters, you can live life to the full with the wind in your hair! Though this will certainly get your heart pumping and plaster a smile to your face, make sure to take in the incredible views of the Thai mountains, jungles and wildlife. This is the stuff you talk about to make your friends jealous and inspire your future grandkids! If heights don’t do it for you (or you just love the water as well! 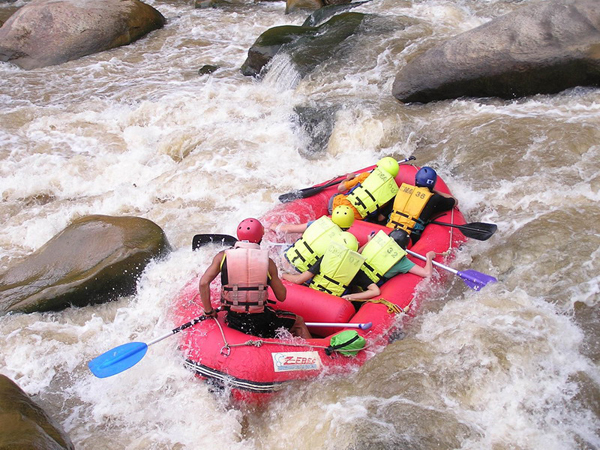 ), this activity also includes conquering the Mae Tang River and its many rapids in a raft. 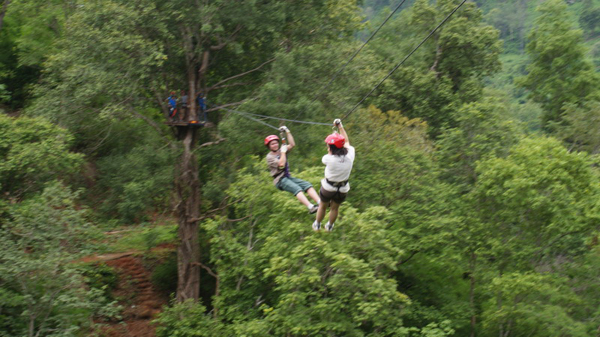 Awesome way to really get your adrenaline pumping in Chiang Mai! The Mae Tang River is widely regarded as having among the best white-water rafting in Southeast Asia, and for about 2 hours you will navigate its secrets in a way that will surely make you feel alive. Awesome adrenalin rush with expert guides! Though it may not always feel like it when you’re touring with friends through jungles, mountains, rivers, and the skies of Thailand, there actually are locals who’d love to share their unique and intriguing culture with you. This incredible activity also gets you into some remote villages to experience things you have never even dreamed of before! Make new friends, learn new tidbits, and expand your culinary repertoire on this mind-blowing experience. Ferris Bueller once famously said, “If you don’t stop to take a look around once in a while, life might just pass you by.” Don’t let life just pass you by; get out there and experience the wilderness of Thailand for an experience you will never truly forget. What’s the best day of adventure you’ve had?